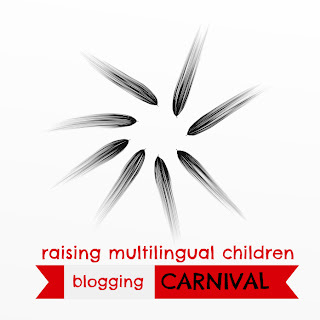 Welcome to the second instalment of our blogging carnival on raising multilingual children. Cordelia, aka the Multilingual Mama, did a great job last month to get us started with the new version of this blogging carnival. Her issue was full of great posts with tips and ideas. As this month's host, I thought I'd reiterate my thanks to Letizia from Bilingue per gicoco who started this amazing community. As she went on to bigger and better projects, I was sad to loose this monthly contact with amazing bloggers. So, I decided to take the matter in my own hands and together with the help and support from Cordelia and Jen (from Perogies & Gyoza) got it started again. We had no theme this month as I wanted to give the opportunity to everybody to submit an article. This means we have A LOT of brilliant articles. The bloggers below share their passion, tips and difficulties in raising children learning more than one language at the time. Be sure to visit your favourite ones, the ones whose story resonate with you and the ones you have never 'virtually' met. As bloggers we love comments, so please leave them a word or two. 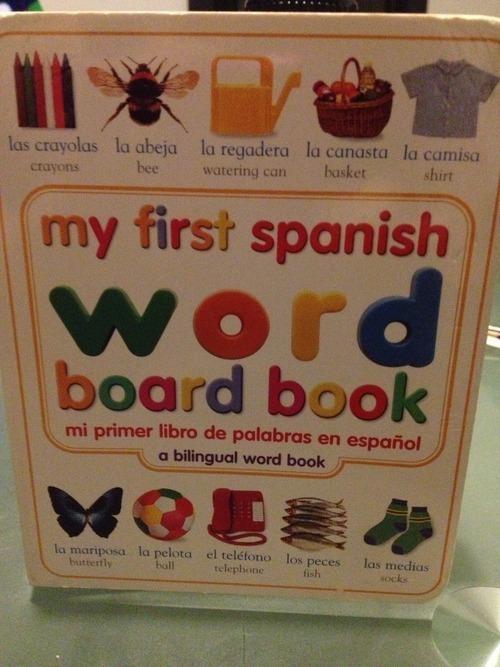 Sarah from Bringing up baby Bilingual shares a brilliant idea for a card game for her son to practice his French (with a great egg carton recycling idea). I loved those very practical tips. Cordelia, aka the Multilingual Mama, shares how a puppet helped her daughter overcome her reluctance at speaking French at home. I can vouch for this. 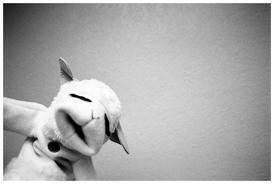 We have tried it and it is amazing how kids respond to a puppet. Jay at All this Chinoiserie (love this title), has compiled a great list of resources for Mandarin learning. It is his first appearance in the carnival, so please show him some love. Stephanie from InCultureParent gives us 5 games to try and make our children talk. I found this especially good for minority language play. Adam from Bilingual Monkeys, explains how complicated poems and texts are great seeds to be planted in children's head and how we shouldn't worry about them not understanding every single word. Amanda, aka Miss Panda Chinese, shares her five best tips for multilingual parenting. I especially loved her last one to "be like water"! Maria from the Paris Busy Bee blog shares how her children (and probably a lot of other multilingual kids) are different (in a cute way) from other kids. Leanna from All Done Monkey wrote a guest post on The European Mama's site about how her son is starting to correct his dad's non-native English. I guess all non-native speakers will go through this with their kids. My husband just did too! Stephen from The Head of the Heard, feels his son is about to have a breakthrough in language skills development and shares what it is like. Such an exciting time for any parent! 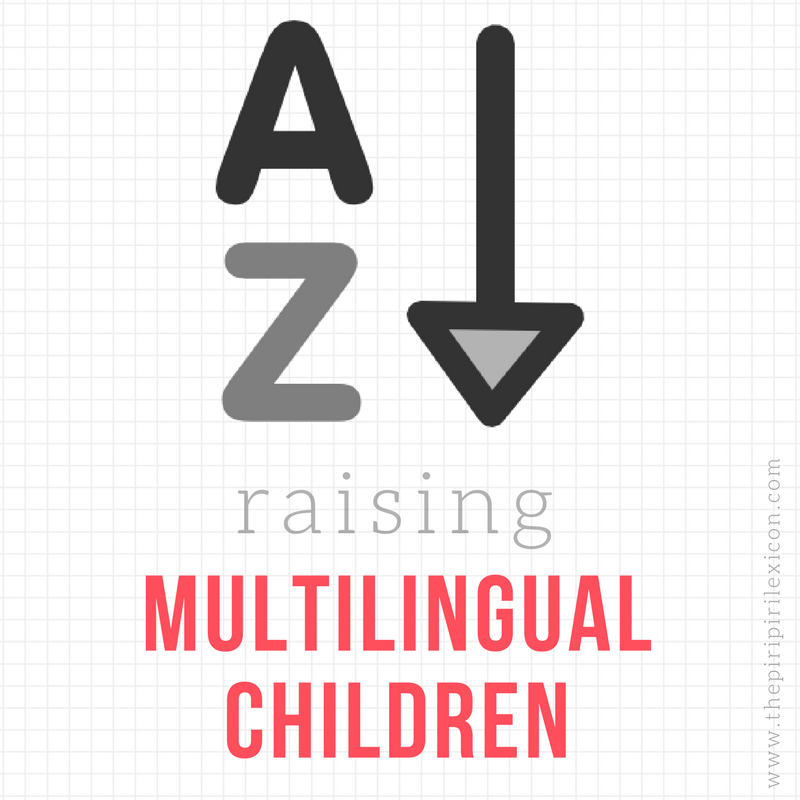 My own post is here and it is about the myth claiming that your child needs 30% exposure time to his minority language and how it does not work for us. Mercedes at Project Procrastinot explains how her perfectionism can sometimes stop her from doing what she knows is best for her children and how difficult it can be to change language habits. She had me saying, oh yes all the way through. Nicole from Simulated Immersion updates us on her (very cute) son's development and explains how she is creating her own little immersion situation in her own home and improving her own language skills. I can but be so amazed by her determination. Diana from LadydeeLG writes how a couple of words may mark the beginning of her son's language dominance and what her family is trying to counter-balance it. Oh, the slippery slope I know all too well. Ute, from Expat since birth, explains how she and her husband chose the language to speak their child(ren). Not an easy decision when you are multilingual yourself. Olga, aka The European Mama, shares her thoughts on the term 'Mother Tongue' and what it means to us as parents of multilingual kids. This is an issue I am sure we all wonder about: how will our kids describe their mother tongue? Jeanne at Soul Travelers 3, explains how she and her family are creating an immersion situation through travel for their daughter to learn Spanish. She is also a first-timer on the carnival and we are so glad to have her. Esther from Third Culture Mama, explains the language tiers idea: a language that is important to you may not be to the society around you and how French in particular is viewed in the USA. Very informative post that got me thinking about our own languages statuses. Michelle from Mother Tongues blog shares her thoughts on how biculturalism may (or may not) be associated with bilingualism. It is not always the case that both go hand in hand but it is an important aspect of our children's life we should think about too. Souad from BabelKid wrote a lovely article about how her children may not experience her culture in the same way as she did/does. Watch out readers! She almost made me cry. Go and fetch a box of tissues before you click if you are an expat missing home or are having an off-day! Becky from Kid World Citizen, wrote a post on Spanglish Baby about how nicknames are common and inherent to the Latino culture but thought offensive or misunderstood by other communities. If you have made it this far, well done. To find out more about the blogging carnival, have a look here and join us next month when the carnival will be hosted by Leanna at All Done Monkey. wow! this is fantastic! thank you for all your hard work! Thank you for reviving the carnival and great job on getting all of these posts together! So grateful that you revived these carnivals! Well-done overview of a fantastic collection again this month. Wow! So many resources! I love how you categorized them for easy reading. Thank you! Great ones! I must admit I was a bit disappointed not to see the post I submitted. I joined the group and sent early. We are monolingual American parents who have raised a fluent-as-a-native trilingual/triliterate ( Mandarin/Spanish/English) ...and now that she is 12, we can say it has all been well worth the effort and next she wants to add French! I never got your message. But I have now included it in the post. Thanks so much Annabelle! I am happy to join in this fabulous group! !